Any UK registered vehicle that is 3 years of age or older must undergo an annual road safety and emissions test. The Ministry of Transport test or MOT as is the commonly used abbreviation for such an annual vehicle test. 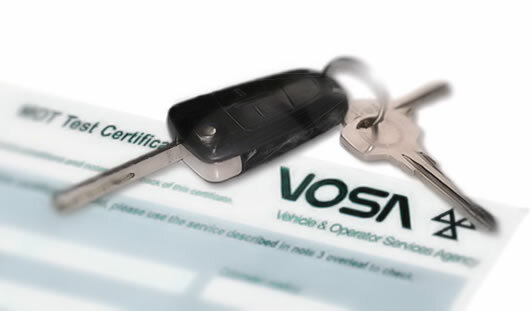 The Vehicle and Operator Services Agency (VOSA) are responsible for the various safety and emissions checks implemented in the MOT test. Vehicles under 3 years of age are not required to take an MOT test. For vehicles over 3 years of age, a valid MOT test certificate and vehicle insurance is required before it is possible to tax a vehicle. The following checklist is conducted usually in a specified order on every MOT test. If a particular item exceeds the limits set by VOSA it will fail the MOT. If an item is close to the limits, that particular item will pass the MOT but the engineer will write an advisory note on the MOT certificate. An MOT engineer is also not permitted to remove personal items. So for example if a child seat is secured on the rear seats, the engineer may not be able to test a rear seat belt if the child seat prevents this. Below is what an authorised MOT tester looks at on your car. This basic MOT checklist should help you prepare your car for an MOT inspection. This test includes any excessive corrosion that may render the vehicle unsafe for road use or by developing jagged edges etc. Tests that the bonnet securely closes and latches in place. Tests that all doors securely close and latches correctly. Door hinges are inspected for general condition and security. Front doors must open from both inside the vehicle and outside. Rear doors must open from outside the vehicle. General condition of windscreen tested. The swept part of the windscreen (the part where the wipers travel) should have cracks no longer than 40 mm. Chips or cracks in this area (110 mm from the centre of the steering wheel and each side) must be no more than 10 mm long. Test wipers for excessive wear and operate washer to ensure driver has clear view ahead. To test steering operation and oil level. Testing of steering pipes and hoses for corrosion. Check operation of the steering lock mechanism. Check of the MIL for electronic power steering and steering lock. General condition and safety of wheels and tyres. A test of the tyre size and correct type. Tyre tread depth tested – See Tyre legal limit for further information on assessing the legality of tyres. Spare tyres are no checked. Tyre pressure monitoring system inspected on vehicles first used on or after 1 January 2012. Testing of general condition and for inappropriate repairs or modification. Brakes tested for efficiency. The removal of wheels and wheel trims is not part of the test. ABS or electronic stability control (ESC) where tested fitted. Check of the MIL for ABS, electronic stability control, electronic park brake and brake fluid warning. See anti-lock brakes for a description on how ABS works. Checks establish if the system is secured and complete. Catalytic converter must be present if one was fitted as standard. Exhaust must not be excessively noisy and not have serious leaks. The vehicle must meet requirements for exhaust emissions dependent on its age and fuel type. The driver’s seat must be adjusted. All seats must be securely fitted and rear seats can be secured in an upright position. Fuel system is tested for leaks, how secure and general condition of any hose and pipes. Fuel cap will need to be opened to test if it opens and closes securely. (Key must be available if applicable). All seat belts fitted are tested for the correct type, operation of device and general condition. Mandatory seat belts must be in place. Pretensioners tested and the malfunction indicator lamp (MIL) is tested for air bags. Mirrors must be securely fitted and in good condition. The tailgate or boot of vehicle to be safely secured when in the closed position. Number plate characters must be of legal size, form and spacing. Condition, colour and security of plate tested. Operation of all lights tested including indicators, brake lights and number plate lights. Main beam warning light tested, headlight aim direction and general Condition, operation including HID and LED head lamps for cleaning, self-leveling and security See car lighting law for further information on the various laws regarding the use and legalities of vehicle lights. Operates correctly and is of suitable type. Identification number is first used on vehicles on or after August 1st 1980. Only one unique VIN is displayed except on multistage build vehicles. Even if you have a basic knowledge of cars, preparing it for its annual MOT test may save you time as fewer repairs will be needed before an MOT pass certificate can be issued, and money as you can source your own parts that need replacing which may be cheaper than the station conducting the MOT. Use this simple MOT preparation checklist to ensure your car stands the best possible chance of passing, or passing the MOT with as few repairs as possible. Check the vehicle horn is working. Test all lights, to include indicators, number plate and brake lights. Check all seat belts can be securely fitted, are not frayed or torn and that the pretensioners work as they should. Check the windscreen wipers work. That they have no tears or splits in the blades. Ensure all washers jets work. Check the tyres are of road legal use. There must be a minimum of 1.6 mm of tread depth around the entire circumference of the tyre and across at least 3/4 of the breadth of the tyre. Check there are no significant cuts or bulges in the tyres. Read for further information on how to check Tyre legal limit. Spare tyre is not checked as part of an MOT test. Test your brakes are working efficiently. When pressed, there should be tension. If they feel spongy, there may be air in the hydraulic system which will need to be removed. Handbrake should be applied so to secure the vehicle. (Test on a slope). Handbrake when applying should feel tense relatively quickly as the cable tenses and tightens. If lever needs lifting too high or does not begin to tense, cable may need replacing or tightening. Check the windscreen has no large cracks as this is likely to fail an MOT. The swept part of the windscreen (the part where the wipers travel) should have cracks no longer than 40 mm. Smaller chips may pass providing they are not affecting the visibility of the driver. Chips or cracks in this area (110 mm from the centre of the steering wheel and each side) must be no more than 10 mm long. Small chips should ideally be fixed before an MOT test takes place. Bounce each corner of your car to test the shock absorbers. The car should remain settled after one or two bounces on release. If not, shock absorbers may need replacing. The exhaust system can be checked by asking someone to place a cloth over the end of the exhaust to stop emissions from passing. If there are no leaks in the exhaust, the car should stall within seconds.